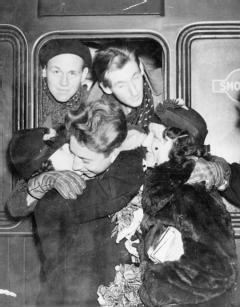 7/12/1938: Members of the British Battalion returning home to Newhaven on board the SS Versailles. 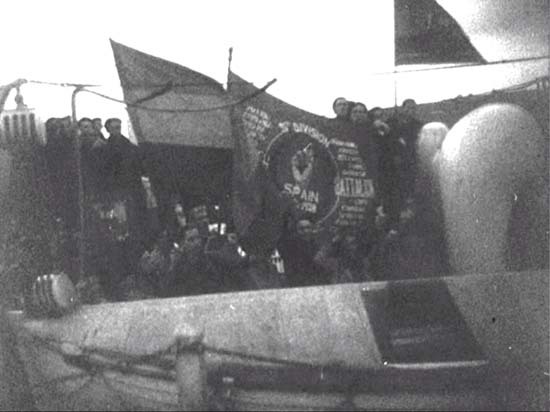 The Battalion and Major Attlee Company banners proudly on display aboard the SS Versailles. 7/12/1938: British Battalion volunteers pictured on the SS Versailles after it docked at Newhaven. 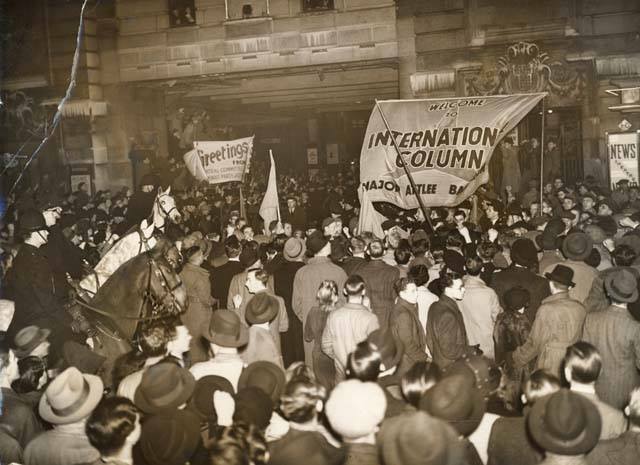 Salute for a British standard bearer as he steps off the train at Victoria station. 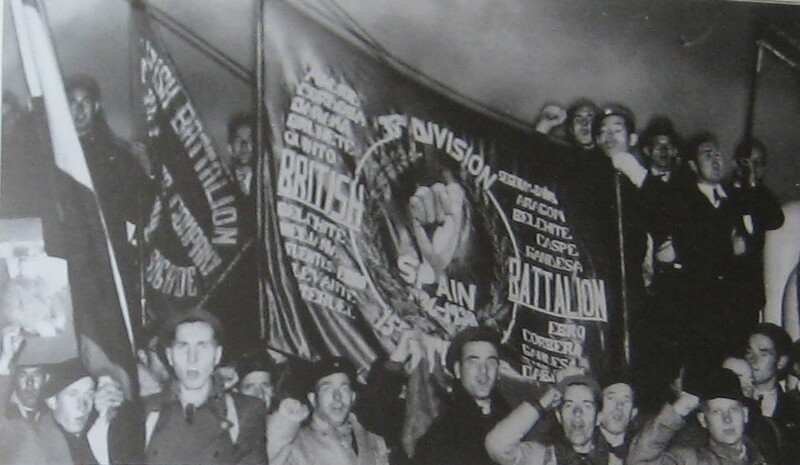 Members of the British Battalion at Victoria Station, London. 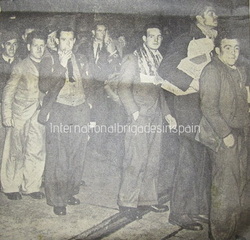 'Ces' Bibby from Liverpool stands second right. 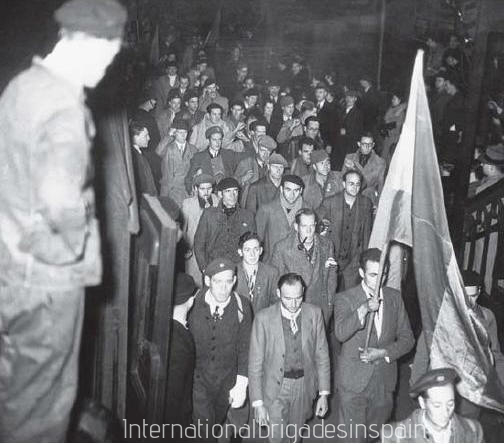 7/12/1938: Battalion members march through Victoria Station. 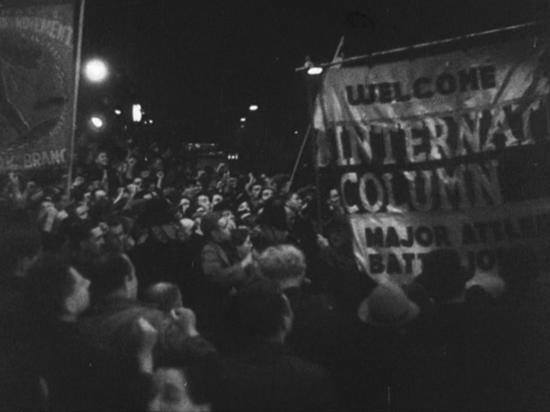 7/12/1938. 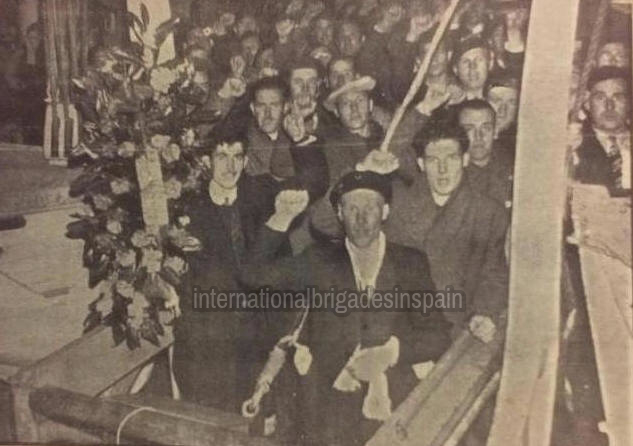 The 300 or so surviving members of the British Battalion on parade at Victoria Station, London. 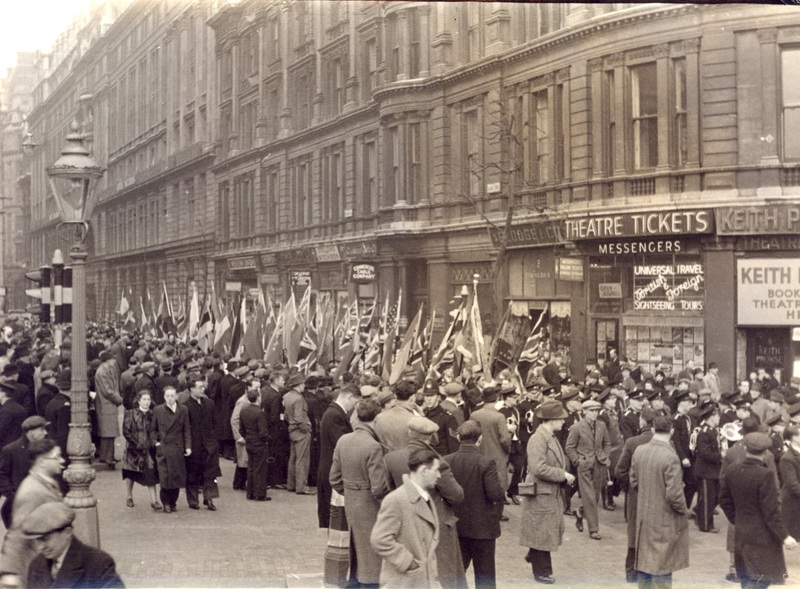 Crowds gather to pay tribute to the British Battalion. 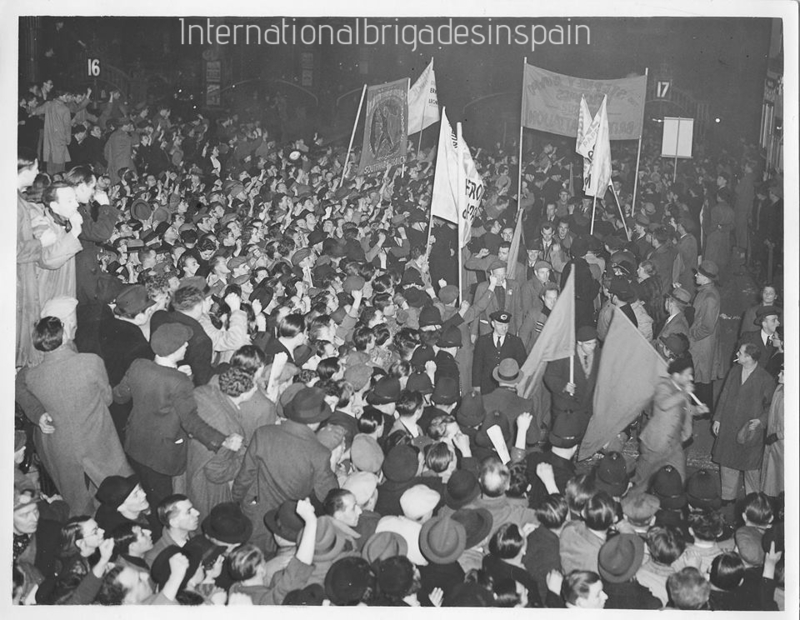 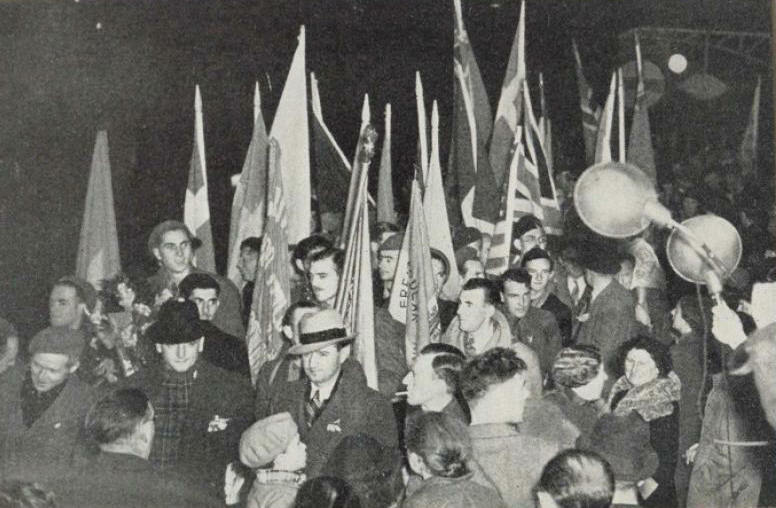 The flags of the 52 nations from which men and women came to fight fascism in Spain can be seen as Battalion members leave the station, They were then taken by bus for dinner at the headquarters of the Cooperative Wholesale Society in Prescot Street, Whitechapel. 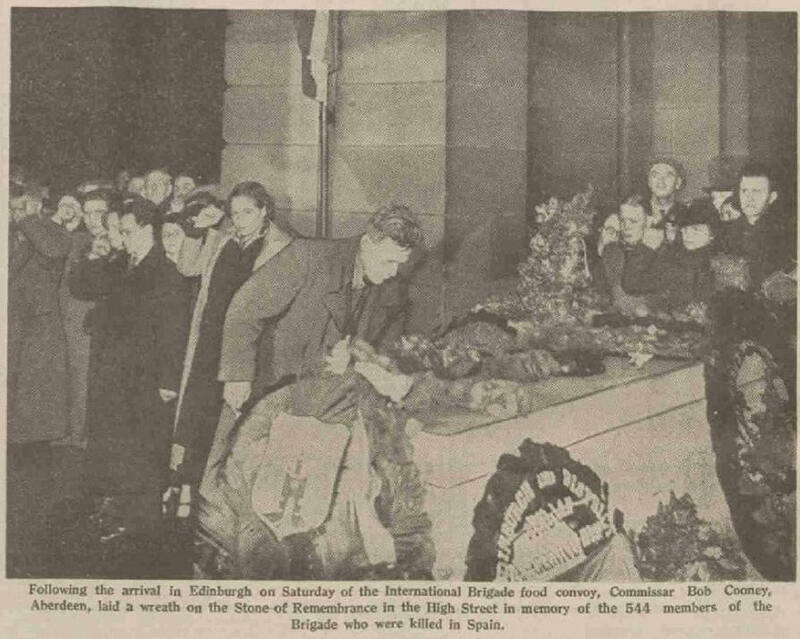 Dundee Evening Telegraph, Friday 9th December 1938. 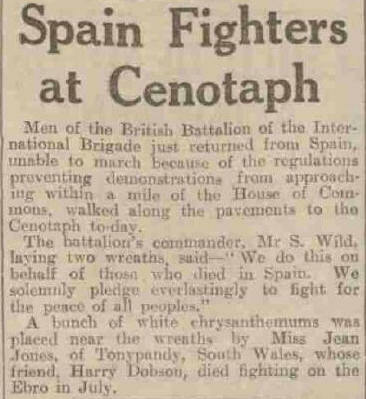 Friday December 9th 1938: George Fletcher and Sam Wild lead members of the British Battalion on a parade to the Cenotaph. 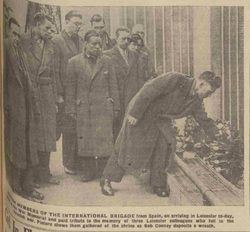 Battalion members were laying a wreath in honour of those who fell in WW1 and to their comrades who died in Spain. 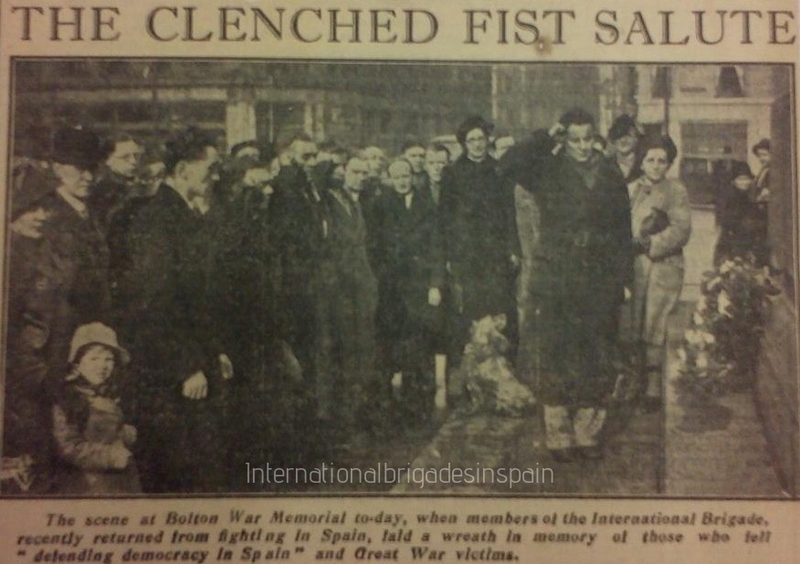 Yorkshire Evening Post, Friday December 9th 1938. 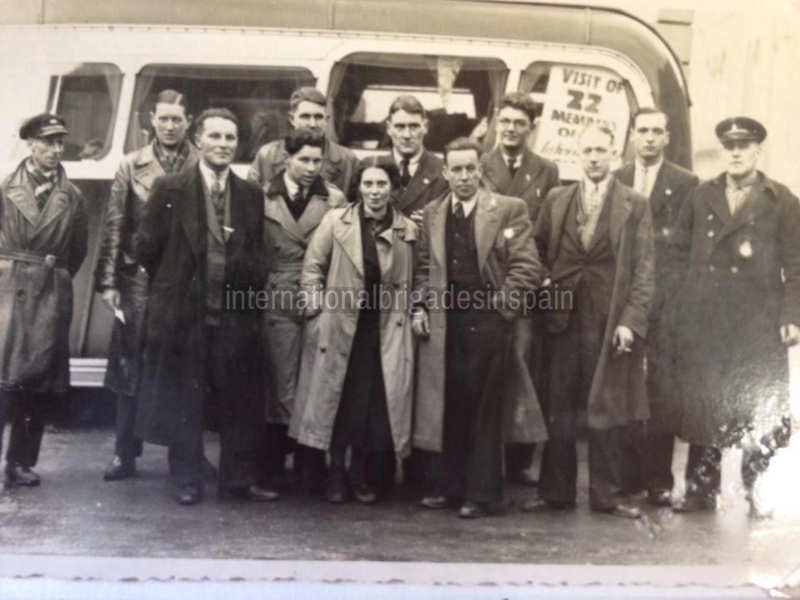 Upon returning to the UK, many of the surviving members of the Battalion embarked on a speaking tour to raise awareness and funds for the Spanish people. 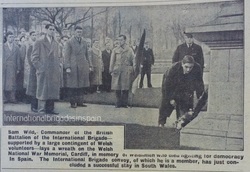 It lasted 32 days from 9/1/1939 until 8/2/1939, and took in the length and breadth of the UK. 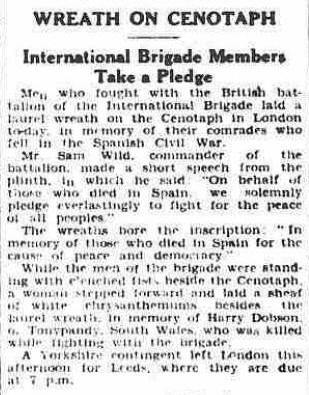 Report in the Glasgow Herald 23/1/1939. 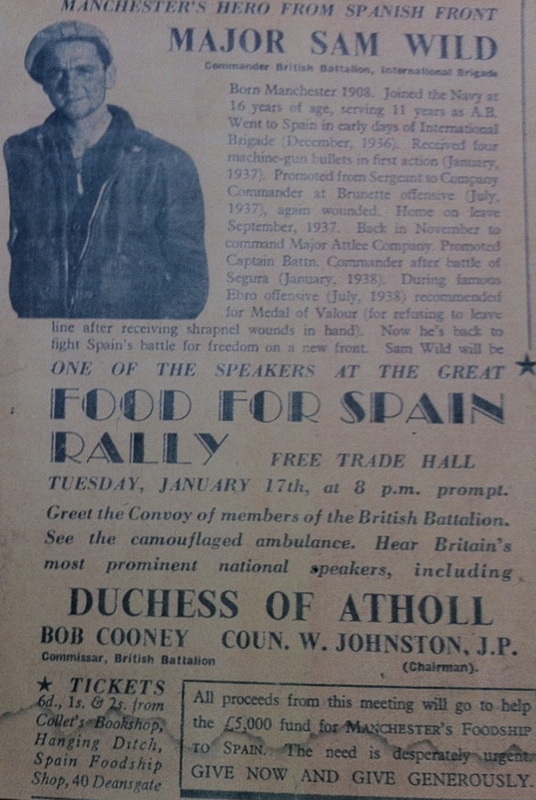 Aberdeen Press and Journal Friday January 27th 1939. 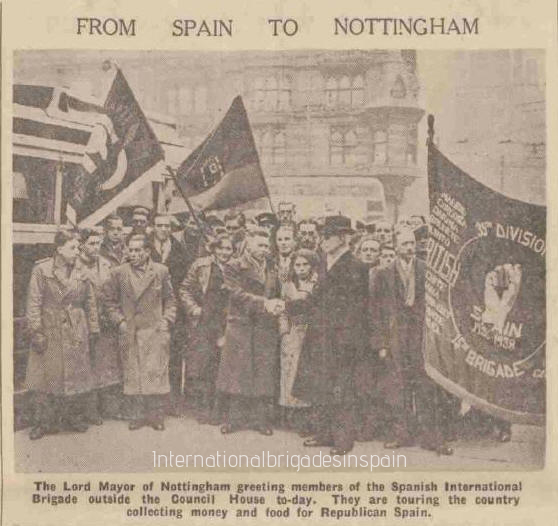 2/2/1939: British Battalion Commissar Bob Cooney is greeted by the Lord Mayor of Nottingham. 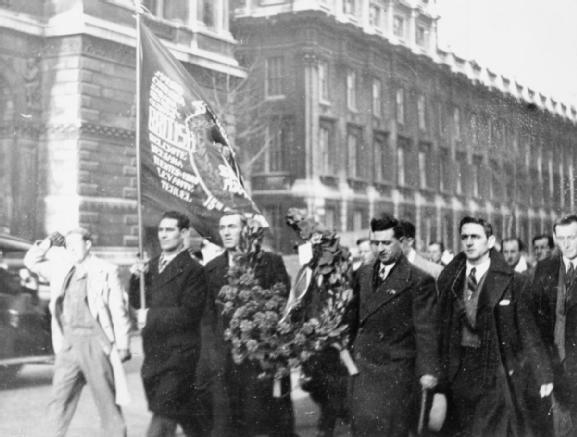 Arthur Nichol (third from left) Nurses, Margaret Finlay and Mary Slater stand either side of Bob. 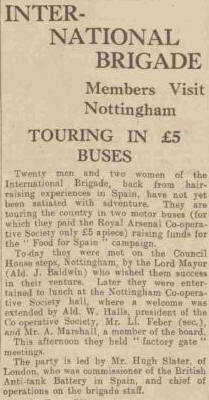 Convoy Report Part 2: February 2nd 1939: Nottingham Evening Post. 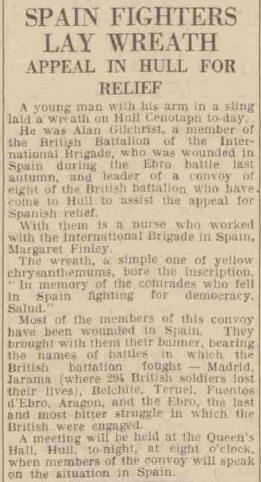 Hull Daily Mail, Tuesday, 31/1/1939. 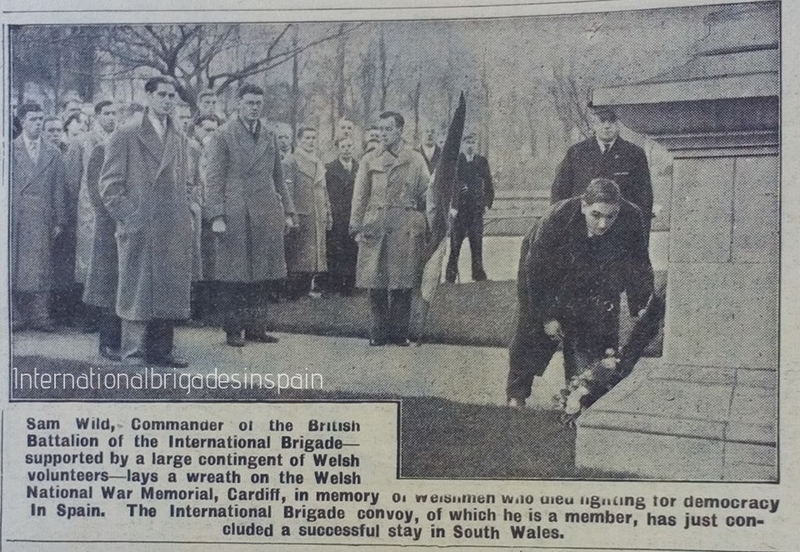 Edinburgh Evening News, 23rd January 1939. 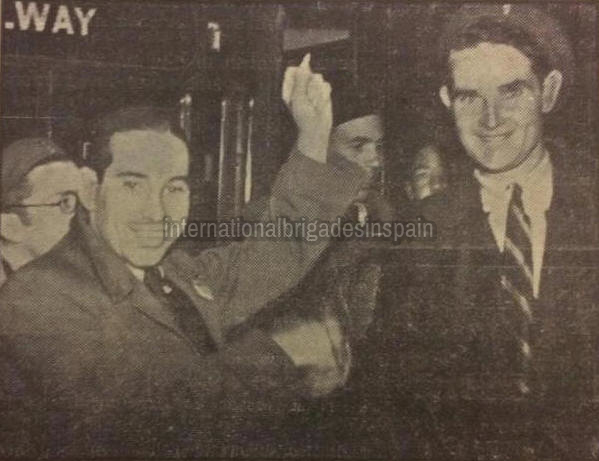 Mary Slater and Bob Cooney.